Vast, rolling plains, seemingly miles of visibility, disclosing dark moving shapes which are, in fact, distant elephants, and tall skinny shapes which, on closer inspection, reveal giraffe necks as they scour tree branches…Kenya is where “safari”� was born and the Masai Mara is, far and away, Kenya’s best. 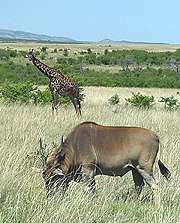 The Mara is huge and alive with animals, birds and the tenacious savannah vegetation. Crosshatched with safari dirt tracks whose route map is known only to the expert driver guides, the Masai Mara is a visual challenge: anywhere you look will present a fascinating wildlife drama. “Safari”� is Swahili for “travel”� and as you safari through the 600 square miles of this protected reserve, your travel takes you through an ancient, elemental world. Prey and predator. Life and death. Nature’s balancing acts play out daily in the savannah, acacia woodlands and forested riverbanks. You’ll hear the phrase “Big 5”� bandied about and, of course, they’ll top your own game viewing list as well: lion, leopard, elephant, rhino and buffalo. Chances are good you’ll see them all here. And more, much, much more. Wildebeest and zebra in migratory motion, Thomson’s gazelle and eland, hartebeest, topi, ostrich, cheetah, jackal and hyena – and that’s only a scattering of the ground level denizens. Eagles soar, vulture circle, secretary birds strut and posture, blue necked guinea fowl root, hippos and crocs share an easy riverbed truce – one in noisy, splashing groups, the other as silent statues surviving from times prehistoric. Nomadic Masai tribesmen, grazing their cattle and goats outside the park, present slender scarlet silhouettes. Red, they believe, is a color feared by predators, and their own bravery protecting their herds is legendary. Masai women, dazzling in beaded jewelry, carry water, fire fuel and building wood…their gender roles as immutable as the natural ecological patterns they seamlessly fit. In mid-July to mid-September two million zebra and wildebeest forage north from Tanzania’s Serengeti into Kenya’s Masai Mara – this is one of the world’s greatest wildlife viewing experiences. 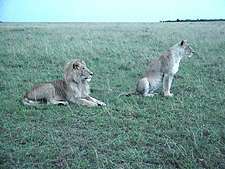 One the safari-goer shares with prides of lions as the passing menu potential is sized up by hunting lionesses. Every day in the Mara is unique, unfolding natural wonders, casting its spell. It was on our first full day in the Mara that we witnessed the birth of a giraffe – a sight seldom seen and a rare privilege we were granted. Go slowly here, eyes scanning, cameras and binoculars ready, speak in whispers and you’ll pass without disturbing…and the Mara will reveal its secrets.